It is not possible to be successful in blogging with only your real-life friends and family members as your readers. Nor is it possible to build-up and maintain personal relations with thousands of other bloggers, just so they keep reading your blog. Needless to say, most of the traffic on popular blogs comes from the searches people do on various search engines like Google. For this reason, it becomes essential to ensure that your content is written in such a way that it can be discovered by search engines. This process is known as Search Engine Optimization or SEO for short. So how do we write Search Engine Optimized content on our blog? Here are 10 Search Engine Optimization Tips to get you started. First, you need to do a research of the phrases people use to search for the content you plan to write, i.e. your niche. It’s only when you know these “keywords” that you can “optimize” your content for them. Once you have a list of probable topics for your blog posts (based on the keywords that you researched), you need to include these keywords in your post titles. Doing so gives your post a better chance of ranking higher in the search engine results. This is a bit of HTML code added to the beginning of your post that tells the search engines what your post is all about. Meta tags are often misused for stuffing irrelevant keywords, but meta descriptions are good. They are brief “human-readable” summaries of your post and they include your main keywords. You don’t need to know HTML to add them. Both Wordpress and Blogger give the option to add this information to every post on your blog. Your post should ideally be at least 250 words in length. Any article shorter than that is not much liked by search engines. Split your article into sections and give appropriate headings/sub-headings for each section. Include your keywords in these headings for better search engine optimization of your post. Ideally, your post should contain a keyword density of 10-15%. So if your post has 400 words, the keyword phrases should make up about 40-50 words. Too high keyword density is considered as "keyword stuffing" and can get your blog banned from search engines. Many times, people land on your content through an image search. So you must optimize your images too. Use your keywords as names of the images added in your posts. Add these keywords to the image alt and title tags as well. Optimize the links to other related posts on your blog. Don’t put links on generic words, like “click here”. Instead, use the specific keyword phrase that the second article is about. The default permalinks of Wordpress blog posts are of the format www.xyz.com/?=123. These permalinks are not at all search engine friendly. Ideally, you should have your optimized post title in the URL. Here’s a guide to change the Wordpress permalinks - http://www.elegantthemes.com/blog/tips-tricks/wordpress-permalinks. Lastly, but most importantly, write your articles first for your readers and then for search engines. Keyword spam can get you a higher ranking in the search results, but your visitors will not convert into followers if they can barely understand what you’ve written. Following these Search Engine Optimization Tips, you’ll be able to get a higher search engine ranking for your content, thereby getting more traffic to your blog. Then, if your content is well written, some percentage of these visitors will also become loyal readers. Do you optimize your blog posts for search engines? Which of these SEO practices do you already follow? Which of these SEO tips would you like to implement now? This is my 19th post for 2015 AprilAtoZ. Link to the previous post: A to Z of Blogging: R - Readers. 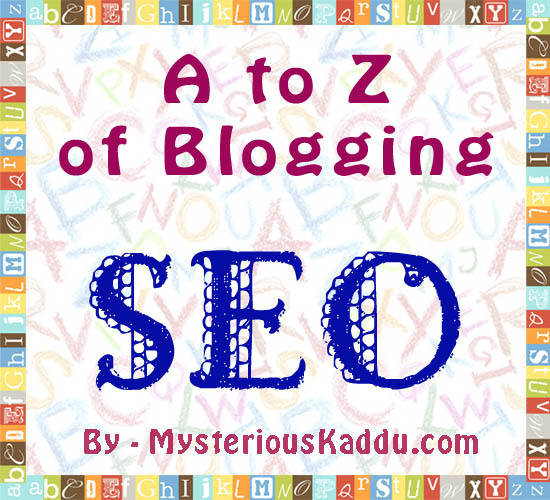 SEO was a mystery to me...I never understood a word of it! But you made it sound so simple!! I'm bookmarking this post so that I come back to it again and again till I get it completely. Thanks..that was just what I needed!! Shilpa, I don't much care about SEO on personal posts. It's only when I write recipes or reviews that I bother with it. You're welcome, Shantala. Have a go at it... it's not that difficult. @Sundari Venkatraman: Rightly said, Ma'am. Content is king! Sanch, you won't believe this... I haven't optimized a single image during this series! My images are called "A.jpg", "B.jpg" etc. I'll rename them all next month and then add the alt and title tags. Have tried most SEO methods in the post :) To find new readers. But the best method I've felt that's worked is Bloghopping. Leo, bloghopping can get you only a limited amount of traffic. How many blogs can you visit and comment on daily? If you're aiming for over a thousand pageviews per day, you need to optimize your content for search engines too.